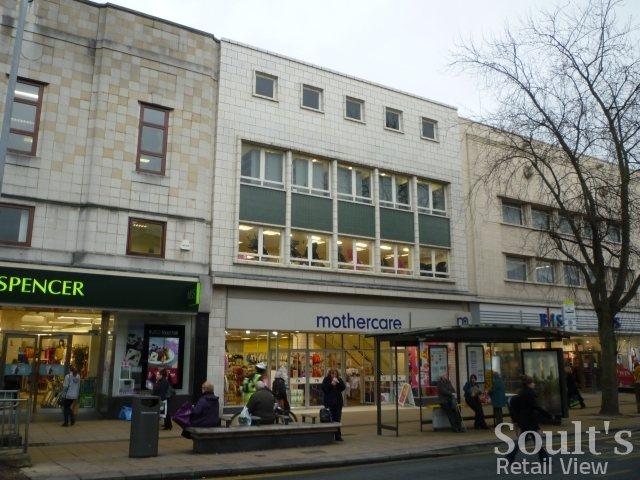 Never one to let a good Woolworths anniversary pass me by, today – 20 September 2013 – represents 73 years since Darlington’s Woolworths store relocated from its original premises, opened on 27 September 1913, to what would become its more familiar location at 12-18 Northgate. 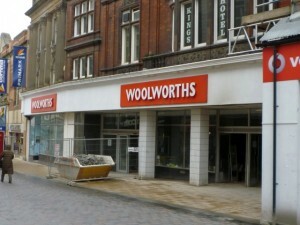 Following the 1940 move, Woolworths traded from that spot for nearly six decades before the company’s high-profile collapse prompted the closure of that, and the 806 other Woolies shops across the UK, by 6 January 2009. As I reported back in 2011, however, Woolworths’ demise was Next’s opportunity, consolidating its two small stores in Darlington into 22,000 sq ft of the ex-Woolworths site (nos. 12-16, above). The remaining 2,050 sq ft portion (no.18, above) was still vacant when I last visited Darlington in May 2012 – complete with the remains of Woolworths’ shopfront, white tiles and black-granite stall riser – and continues to be advertised as ‘to let’ at a rent of £105,000 pa. 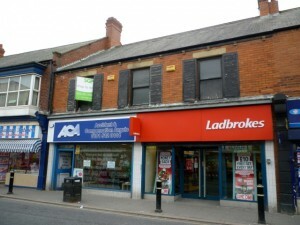 Given the appealing but contrasting architecture of 12-16 and 18, it’s a split that is probably more sympathetic than the old Woolworths fascia (below) that attempted, not entirely successfully, to straddle and unify the two buildings. So, that’s the former Woolworths site in Darlington that most people will already be aware of – but where exactly in the town did the company trade from before that? 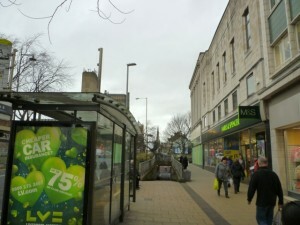 Regular readers will know that I’ve quite often flagged up North East Woolworths stores that moved from one location to another – usually to secure a more prominent spot (Houghton-le-Spring, below), a larger unit (Alnwick), a freehold property instead of leased premises (Wallsend), or a combination of those factors. In many cases, these moves took place in the late 1950s or 1960s, meaning that the 1957 Woolworths stores list – the earliest version that I’ve got – is invaluable for pinpointing the addresses of those original locations. 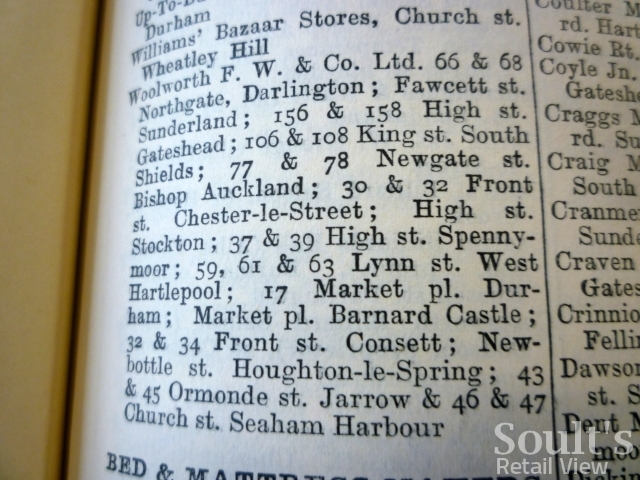 Clearly, however, that’s not much use for tracking down a store that had already relocated in 1940 – so a different tack was needed, involving the 1914 Kelly’s Directory for County Durham. Anyone into their local history will know that Kelly’s Directories were the Yellow Pages of their day, listing the names and addresses of businesses in a given locality. 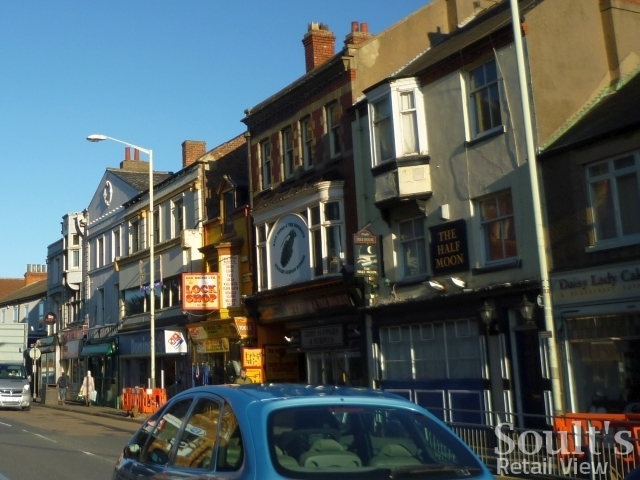 Today, copies of the old directories are found in almost all local studies libraries, and are a key resource for digging out information about long-gone shops and businesses. With the Darlington Woolworths having opened as store #28 in 1913 – only the third branch in the North East, after Middlesbrough (#8, in 1911) and Newcastle (#27, also in 1913) – its details were, as I hoped, listed in the 1914 Directory, with the address given as 78 & 79 Northgate. Searching online, this is backed up by a reference from Darlington’s building plans archive, dated 2 May 1927, which cites an application for “alterations and additions to 78 Northgate for F. Woolworth & Co. Ltd.; (plan no. 1927/102)”. 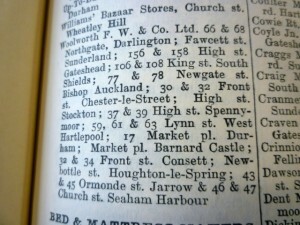 By the end of the 1930s, however, a later addition of the Kelly Directory (above) was giving the Woolworths store address as 66 & 68 Northgate. So, had the store moved since those 1927 alterations – contradicting what I knew from Woolworths’ own internal records – or had the street simply been renumbered? Here, both logic and a bit more research is called for. Most obviously, it’s clear that an address like “78 & 79” simply isn’t possible on the modern-day Northgate, where odd numbers are exclusively on the west side and even numbers on the east – so that points to a renumbering. Another check is to find a business in the 1914 Directory that still exists today, and to see whether the address is the same in both. 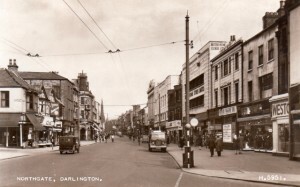 On the face of it, that’s something of a tall order, given the time that has elapsed and the fact that a large chunk of Northgate no longer exists following the creation of Darlington’s four-lane ring road in, presumably, the 1960s or ’70s. 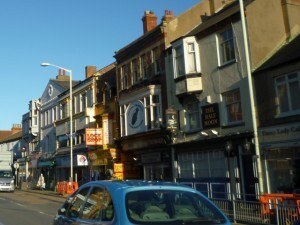 Happily, however, the Half Moon Pub – listed at 52 Northgate in the 1914 Directory – still exists today at no. 130, which again points to a renumbering in the intervening period. The other test, of course, is to see what, if anything, numbers 66 & 68 are today, and a quick search immediately pulls up Mothercare as the present occupant of no. 66. 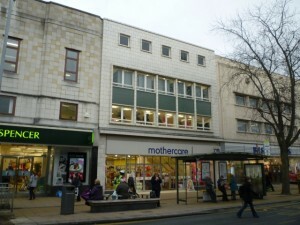 So, having made that apparent connection between the original Woolworths and the current Mothercare, can we find any additional evidence to back it up? 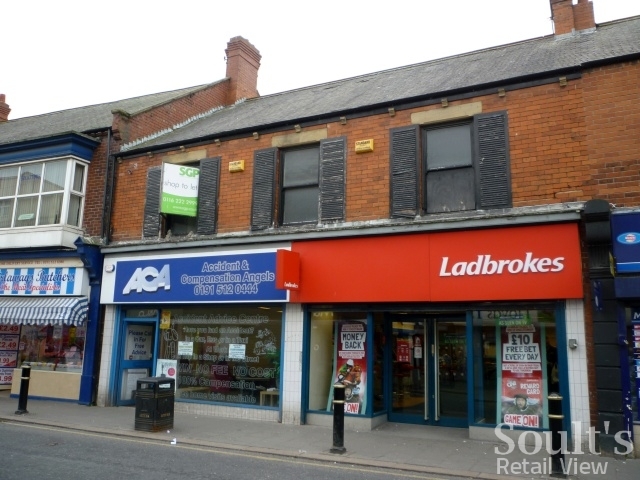 Certainly, the building frontage looks nothing like it might have done as Woolworths before 1940, so, unlike in many cases, we don’t have any obvious architectural clues to go on. However, by locating various old photographs of the street it may be possible to piece the visual evidence together, and to triangulate it with the written evidence already obtained. Here, the most obvious place to start is with a postcard, unfortunately undated, but probably from the 1930s, that actually shows part of the Woolworths store in its original location. Frustratingly, much of it is obscured by a lamppost, but there’s enough there to be pretty sure that it reads ‘F W Woolworth & Co. Ltd.’, and to note that the building has some distinctive bay windows to its first floor. 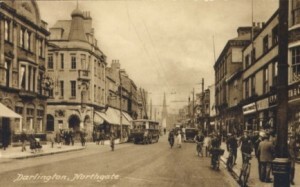 Unfortunately, though the distinctive spire of the United Reformed Church is visible at the end of the street, none of the other buildings in the postcard still exist, so relating it to the modern-day view is somewhat challenging. Equally, it would be good to get a better view of the Woolworths building, without the unfortunate cropping and lamppost. Happily, the postcard below, featuring a near-identical view from the early 1900s, shows the distinctive bay-windowed building in its full glory, seemingly prior to Woolworths’ occupation. 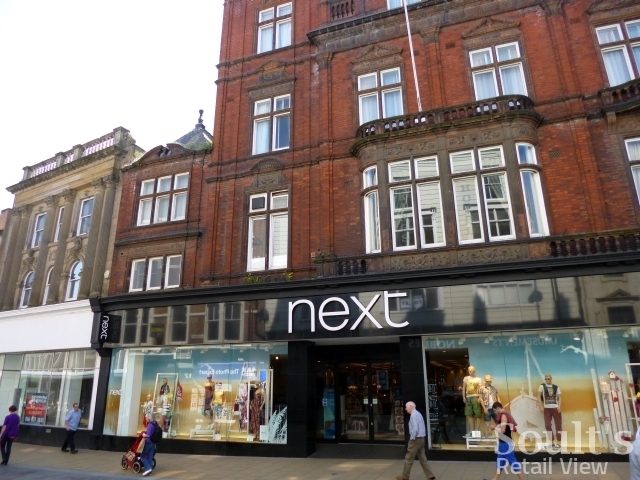 So, now we know what the original Darlington Woolworths building looked like, can we find a slightly later view featuring our target building alongside some other properties that still exist today? Seemingly so (below)! Helpfully, as with any Valentine’s postcard, the negative number (H.5951) means that the date of this photo can be reasonably accurately pinpointed to the mid 1940s, so it’s no surprise that the building in question – clearly visible to the left of the post, in the middle of the picture – is no longer occupied by Woolworths. 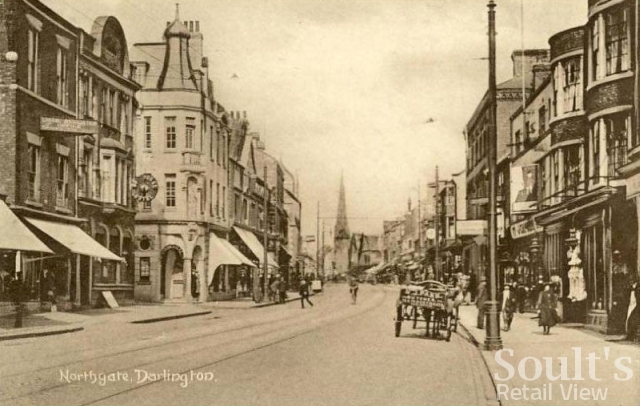 The distinctive presence in both postcards of the unusual turreted building, over the road, also acts as a useful point of comparison, and confirms – if we had any doubts – that the bay-windowed building we see in the 1945 shot is the same one that housed Woolworths in the c1930s view. The final check is to look at what the bay-windowed building has around it. 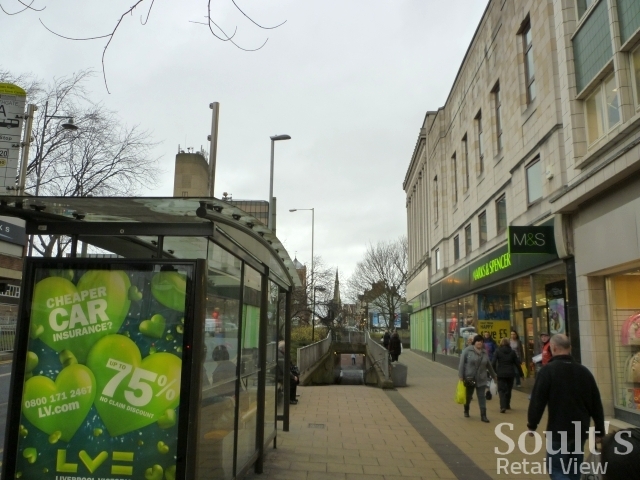 To its right is British Home Stores, and to the left Marks & Spencer – exactly the same stores, albeit with new frontages, that straddle today’s Mothercare. 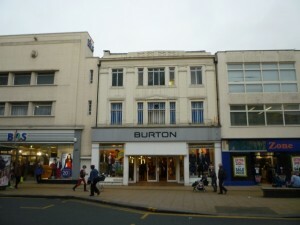 Beyond M&S in the 1945 view, we can also recognise the distinctive purpose-built frontage of Darlington’s Burton store. 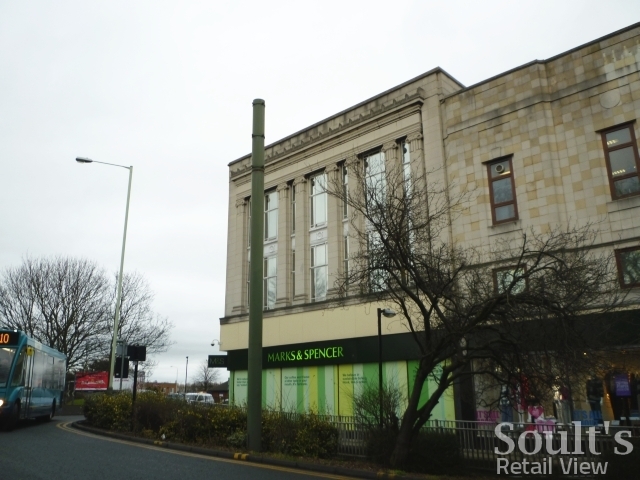 Today, minus its pediment, that is part of the town’s enlarged Marks & Spencer. 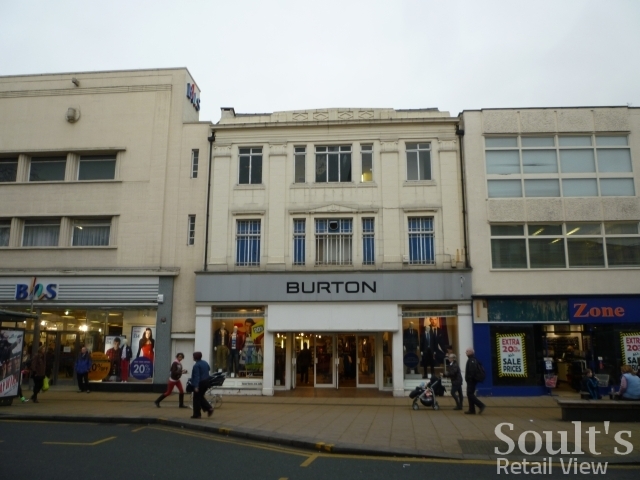 Meanwhile, Darlington’s present-day Burton store (above), trades from the building on the other side of BHS – instantly recognisable as the same building that’s ‘to let’, to the right of British Home Stores, in the 1945 shot. 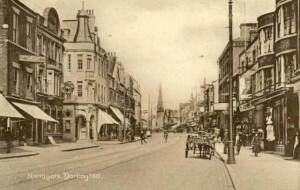 So, by spotting the links between a succession of historic and modern-day images, and connecting those findings to the earlier archival research online and via the Kelly’s Directories, it’s possible to work out the exact location of Darlington’s original Woolworths – while, at the same time, giving a flavour of how Northgate’s present-day retail make-up has evolved from that of a century earlier. 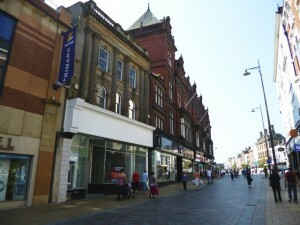 My retail consultancy business, CannyInsights.com, provides bespoke place- and sector-specific market intelligence, including archival research services and extensive coverage and knowledge of County Durham and the Tees Valley. It also works with retailers nationwide to improve their stores, customer communications and market knowledge. For more information, visit www.cannyinsights.com, drop me an email, or give me a call on (0191) 461 0361. I don’t remember Darlo having a BHS or M&S. Are both stores single storey or did BHS have an upstairs? Interesting article. Woolies moved to the new site in September 1940. 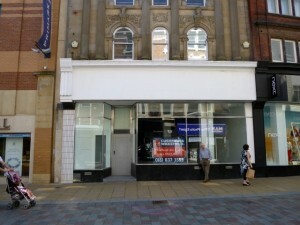 There is an avert in the Northern Echo clearly referring to the opening of a new shop. I have also recently seen a photograph of the of Marks and Spencer on Northgate dated 1937 in which the original Woolies can be seen. How did you come by a 1957 stores list? I bet it’s a fascinating read! I’m jealous! Does it have rarities like Tottenham Court Road and West Hendon as open and trading? It’s not available online at all? Not as far as I know, unfortunately!